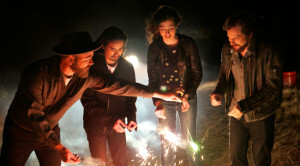 In August of last year, indie rockers Silversun Pickups released “Nightlight,” the first single from their latest album, Better Nature. A trippy music film written and directed by legendary filmmaker Mark Pellington (Arlington Road, The Mothman Prophecies, Foo Fighters, Bruce Springsteen, Pearl Jam) accompanied the song, which AbsolutePunk called “one of the most deliriously catchy and undeniably immediate songs Silversun has made in their careers.” Jacknife Lee, with whom they collaborated on 2012’s Neck Of The Woods, produced the album, which was mixed by Grammy award-winning engineer Alan Moulder. The band, which features Brian Aubert (guitar, vocals), Nikki Monninger (bass), Joe Lester (keyboards) and Christopher Guanlao (drums) is on tour now. Monninger called us from Los Angeles. How did you and Brian first meet? I read it was on a flight to London. We [were in] different schools but we ended up on the same exchange program in Cambridge. After that, we finished at different colleges. Then we became roommates after college in 1997. We started the band in 2000. He was in a different band and I was in a different band and we talked about joining the same band. It really just started in our kitchen. Did you share common interests when it came to music and art? Definitely similar tastes in music. We were going to shows all the time. It was Modest Mouse and Built to Spill and Wilco and Sonic Youth. They were playing all the time in L.A. We would go to shows all the time, especially when we lived in Silverlake and we had so many friends in bands. It was a very supportive scene where you went to see your friends play. We would go to Spaceland and Silverlake Lounge and Echo. We would go to these places and there was so much music in our lives. That subconsciously helped form what we are today. Was there a specific sound? The good thing about the scene at that time was our friends’ bands sounded so different. We were united by our friendships. At our shows, we would sell out friends’ bands CDs. We were just trying to get the music out to anyone. We all sounded different, which made it interesting. I don’t think there was a specific sound unless you want to say indie or alternative. Individually, we all sounded different. Looking back, why do you think your debut Carnavas so successful? At first, we had an EP. We changed our management right after Carnavas. We signed to Q Prime, whom we’re with to this day. They upped the game for us. They took it to radio in a way that we didn’t have the opportunity to do before. We always felt loved in Silverlake. To make it on a national and international level, it helped to have good management behind us. I feel like we’ve been riding along. We’ve been really fortunate. We were also prepared. Before Carnavas came out, we had been together for five years and before our EP came out, we were around for four years. So much of our beginning was playing live and working on our sound and being comfortable with who we were. It made it easier when we had the opportunity to get out there. We were already prepared and we worked hard to make sure that when opportunities come up, we’re ready. It wasn’t part of the plan but was just what happened. Better Nature represents the first release on your newly formed label. Talk about what prompted the decision to self-release the record. It just happened that our contract with Dangerbird was up. It was great being with them for as long as we were but we knew we didn’t want to go to a major label. We wanted to try it ourselves. We’ve been able to work with management to make it work so far. Now, it’s easier to get things done. It’s just us and them and we make a quick phone call. Our intention was to get our album out. I love the variety of press photos you have. What’s the story behind the photo featuring a shipwreck? All the photos for our album artwork were done by our keyboard’s player wife, Rebekkah [Drake]. She had a great idea to shoot in the desert. It goes along with the drought theme and we’re trying to be playful but serious. She did a great job of coming up with the idea and we just ran with it. It was just one shoot that lasted the entire day from sunrise to sunset. It was in this location where a friend of hers lived. It was at an artist’s compound. There were fun things to play around with for the shoot. When did the songs start to come together for Better Nature? We took a little time off after our last album, and things started coming together. Usually, we put out an album every three years. For the first year and a half, we’ll tour and then we take a few months off and then get back together to start coming up with things. Brian spearheads that and has ideas that he brings to us and records some acoustic songs. We all get together and listen and work on them before we start recording. Did the songs head in a specific direction? I think we were all in a good spot where we were open to trying things and experimenting with new instruments. I play a vibraphone on there, and I play a piano part too. Usually, that’s all Joe’s parts. It was a great collaboration between us. Physically, it was a great spot to record at. We recorded at Jacknife’s home, where we also recorded Neck of the Woods. It was fun to go to recording every day. It’s always an interesting drive every morning. His house is at the top of Topanga Canyon in a remote area. He has a Grammy in his studio for U2. It was interesting recording this time because we didn’t record all the way through. We did a couple of weeks there and here. It was all within a few months period. We would have a week or two off. It helped to have everything sink in to see if we wanted to make changes. You wrote “Circadian Rhythm (Last Dance)” about a friend who passed away. Talk about that. From the beginning of the album, the guys wanted me to sing. I’m hesitant. In general, I’m not that outgoing. It was originally going to be something that I just sang alone. We then thought it would be nice to do a duet together. It’s about a friend of ours who passed away last year. It was an homage to him. That inspired me to break through my fears. Jacknife helped bring out the louder vocals and to bring something that was my own to express. It worked really well. Everyone worked together on it. I’m really proud of that song. Brian’s voice is so great. I know. He does a great job. I didn’t feel like we needed my voice in there. I think our voices work well together. I do a lot of background singing and I’ve been his double before. Something matches in our voices. He has such a strong voice that it doesn’t seem like there’s a need but it’s nice to sing on something. I like “Friendly Fires” because it represents such a change of pace. What’s the story behind the song? It’s a nice breath on the album. When we put things together, we always think of how well the songs play together. Brian sings the vocals, so it’s hard for me to respond to what it’s about. The thing about that one is that it’s so minimal but at the same time includes a lot. It’s a great song to just let Brian’s vocals speak for themselves. It’s one of my favorite ones to do live. On that one, I play three instruments – the omnichord, the bass and drum pads. It gave me a chance to have fun playing other instruments. I feel like the album sequencing was very intentional and that “The Wild Kind” works as a good way to close. Did you spend a lot of time thinking about the sequencing of the songs? I think we always thought of it as the album closer. There’s a song we didn’t record because it didn’t seem to fit well with the others. We may put it out as a single. It’s very important to us that the songs blend well. We want to make an actual album. It’s fine with us if you want to buy singles. But to us, it’s meant to be listened to all the way through in order. We have carefully thought about the album order and how things fit together. It’s all very important to us. When we listen to albums that we like, it seems like they’re set up with that in mind. Did you think the band would have this sort of longevity? We’ve been together now for 16 years. We never thought up a life plan but so far everything is working out so we’re going with it.